Make a cute fairy house from an ugly tree stump | DIY projects for everyone! Why go through the grueling task of removing a dead tree stump when you can turn it into a cute garden decor! Mimi, the owner of the gnome tree stump house you see above, thought she could do something creative with the dead tree stump instead of having her husband cut it. The tree stump was located near the street, and so the first thing that popped into her head was to build a house – a gnome tree stump house! It is indeed a great idea. 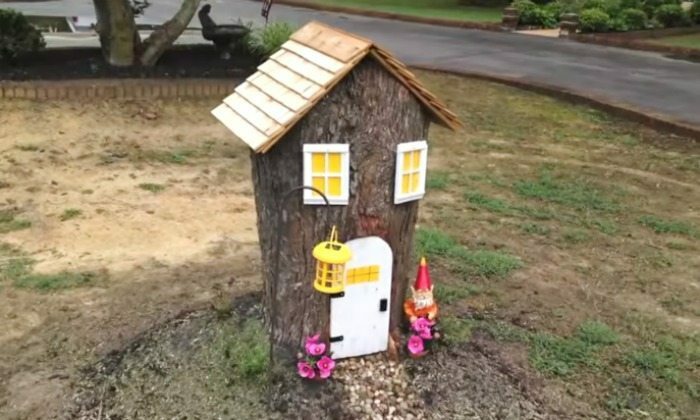 Instead of letting the tree stump become an unpleasant sight in their property, they turned it into a cute fairy house that even the passers-by liked it! Below is a video that shows how they did it. And although they bought new materials for their project, it should not stop you from making used of scraps that you may have in storage. If you have old toys stashed somewhere, you can also use them in decorating your gnome tree stump house!